I'm brimming with happiness while writing this review. It has been too long since a kaleidoscope graced this page, and not only is this kaleidoscope great, it's not limited edition. It's still available on counters so I know all of you can go out and grab it if you wish. This review is long overdue, as is my acquirement of this kaleidoscope. By all logic and common sense this should be one of the first few kaleidoscopes to own from the brand, but I managed to accumulate around thirteen of the lip and eye kits before getting to it. When I confessed this to Dustin he just shook his head in disbelief. 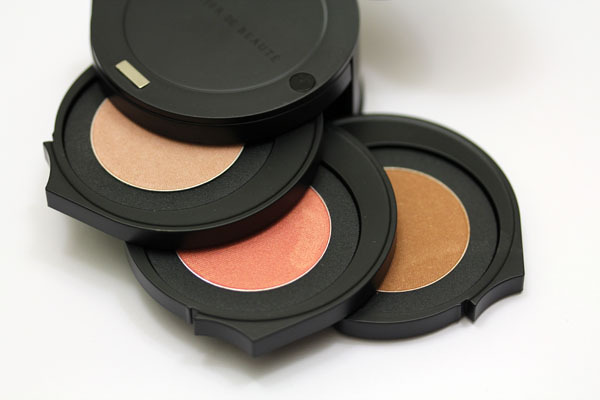 Le Métier de Beauté Flawless Kaleidoscope Face Kit contains four basic shades to set, highlight, and contour your face. I'd consider you fully armed on the face front if all you have in your makeup drawer is Flawless. The few Le Métier makeup artists I've met all swear by this kaleidoscope. Shawn from the Boston counter shared a story of how this kit was a lifesaver when he needed to prep all the models for FNO Boston in a pinch. He just whipped it out and used it on all of them as needed. It's a no brainer, as you'll see why. From top to bottom, Flawless contains the Classic Flawless Face Finish Translucent Setting Powder, Highlighter in Whisper, Radiance Powder Rouge in Echo, and a bronzer. I will talk more extensively about the bottom three in this review, but first, the setting powder. It is imperative that you know I don't use much setting powder. 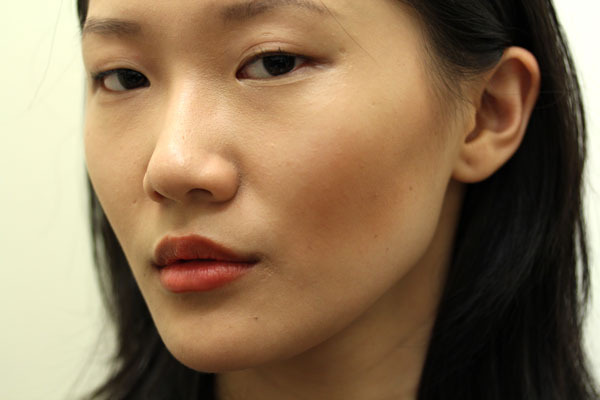 I usually forgo that step because I like the finish my foundations give me. That said, this setting powder is finely milled and blends well into the skin when applied on the face. It is a beige yellow that is a smidge lighter than my skintone, but it is not apparent when I wear it. I think most women would find it very useful to have in this kit. However, if you don't find it as useful, there is a hole under each of the swivel-out compacts that allows you to pop the shade out and replace it with any other shade you might prefer (you'll have to provide the shade yourself, unfortunately). This is a good tip to remember about all your kaleidoscopes! 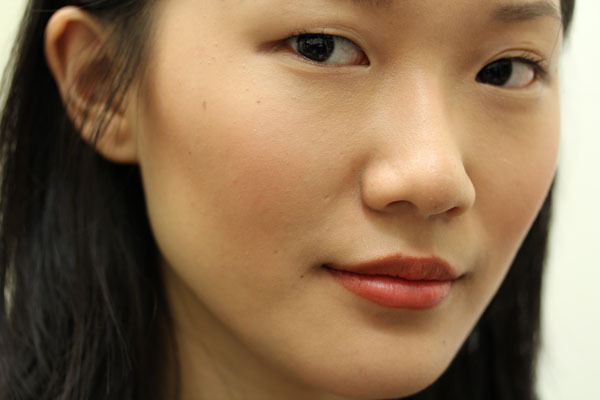 The three bottom shades are what makes Flawless a no-brainer. I used the word "basic" before in the best possible way. 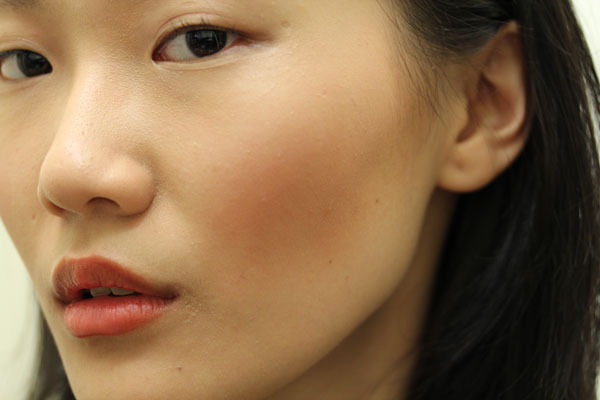 Whisper is an opal pink highlighter while Echo is a coral blush with understated shimmer. The bronzer looks like it contains shimmer in the pan, but swatches decidedly matte. Without a doubt, these are universal shades that will complement everyone within the light to medium range of skintone. Dear reader Katie was the one who gave me the inspiration for the structure of this review (thank you for your patience, Katie!). 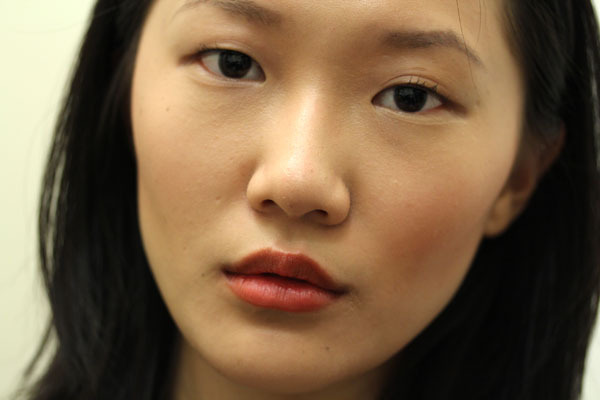 She wanted to know how Le Métier de Beauté blushes performed and was also concerned about the bronzer being too dark for her skintone. In true Messy Wands spirit, I'll show you how it works the "right" (though I believe there is no correct way to apply anything) way, and how it'll look if you overdo it. If you are new to face contouring, I suggest visiting my previous tutorial on contouring before reading ahead. While that tutorial is written using NARS Multiples, the concepts applied are the same. Here's a picture of me before applying any of the face powders. Note that my cheeks are colorless to a fault. 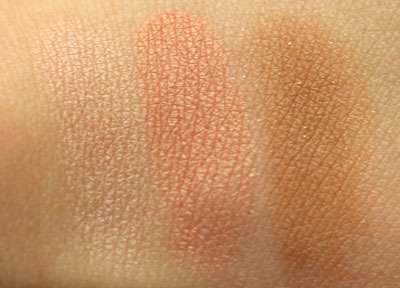 Here is how my cheek looks with just one swipe of bronzer below the cheekbone (I used a MAC 109 brush). Note that if this is still too dark for you, you can always blend it out. Here is how it looks with about four or five stabs of the bronzer piled on top of each other. Here is a soft swipe of Echo placed above the bronzer, and Whisper placed above Echo. Here is how a couple of punches of Echo would look, and a hard swipe of Whisper above it. Another picture to show you the luminescence that Whisper creates. Sometimes I don't know why I bother using anything else. A portrait picture to show you how ridiculous I looked when all this was happening. However! Let's say you made a mistake and came out like above, with one side of the cheek much more pigmented than the other, just take a fluffy brush and blend - you'll see the color diffuse on your face. The opposite to that works as well. If you want more color on the face, all you have to do is add another swipe. As demonstrated above, these powders are buildable. You really cannot make mistakes with this thing. When worn above Chantecaille Future Skin, the powders last all day. Sure, by the end of the night the intensity would lessen, but it was still visible on me. This doesn't happen to many of my blushes (and in case the distinction is crucial: it also does not happen with many of my blushes over Future Skin). 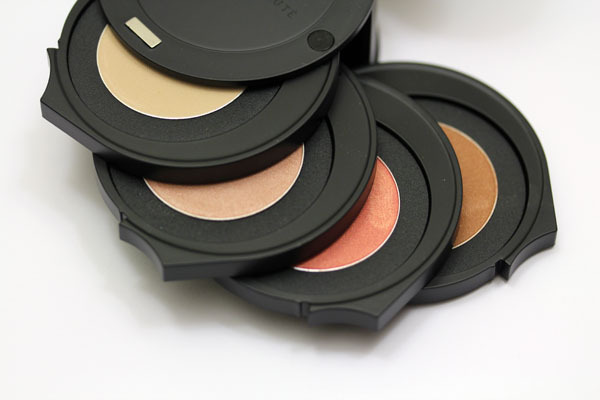 Flawless Kaleidoscope Face Kit retails for $95 and is available wherever you find Le Métier de Beauté counters. This includes Neiman Marcus in-stores and online, select Nordstroms, and Bergdorf Goodman. I know Dustin has plenty lying around at his place so you can also give him a call at 212-872-8612 to get your very own. If you do call him, please let him know you came from Messy Wands! I hope you enjoyed this review. I certainly had fun writing it! Let me know if you have Flawless and cannot live without it, or suddenly have an urge to run to a counter to procure it. You know I love friends to gush makeup with! Well, then I shall gush away. 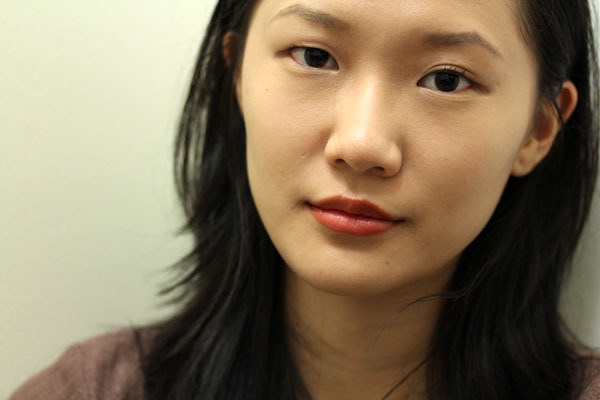 For my LMdB makeover, the SA used Flawless Face on me, and as you know from my blog photos, my cheekbones looked insane! I didn't purchase the kaleidoscope at the time because I wasn't confident that I could replicate the results. Your tutorial is going to go a long way in helping. By the way, what are you wearing on your lips? I like the "autumn coral" vibe. I remember seeing this on the Nordstrom website and thought, meh. But now I am reconsidering that thought. I'm super curious to play with this myself. I think a visit to the counter will be in my near future. I also met Shawn a couple weeks ago. He helped me find a lipstick/gloss combo for the fall, my first LMdB products. Such a sweetie! The colours are perfect for you! Stunning look! I just love your reviews! You are so thorough and always review beautiful products. 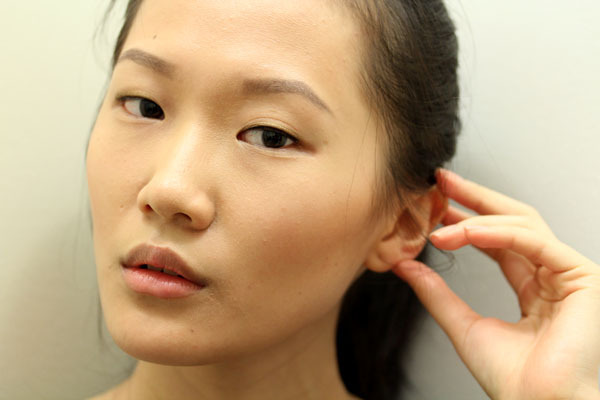 Do you have any specific brush recs to use for contouring? yay, xiao, thank you! i read your review and promptly placed an order with nordstrom. now, can you just come over to my house and do my make-up? As for the lips, I'll post that up soon! Tina- oh awesome! Isn't he SUCH a sweetheart? Samantha- check my tweet darling! Anonymous- thank you so much! That means a lot. I usually use MAC 109 (or a similar shaped brush) to contour. I didn't realize that this existed. I have 2 Kaleidoscopes - Penelope, my go-to eye set, and the Oscar de la Renta one from Bergdorf's FNO. I'm scheduled for a makeover with Kayla in a couple weeks and I'm definitely going to ask her about this. Can't wait to see it! Thanks for the info. Julie- It is SUCH a Le Metier essential, isn't it! bad credit services in selling consumer products. This will ensure that for many months or years to come. So if you get it why is the PPC so popular. Soldering is actually far easier than you may first assume. Keep in mind that they have to part with it.